The Shadow effect converts the drawing layer it is connected to into a dark, blurry matte. You can control the type and amount of blur, as well as the colour of the shadow. Cloning the layers or group. You can then add the effect to the clone, and add a peg on top of the clone to transform it. 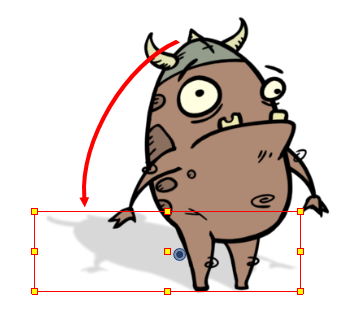 Adding the layers or group to a symbol, then putting two instances of that symbol in your scene. You can then add the effect to one of the instances, and add a peg on top to transform it. TIPWhen creating a drop shadow against a floor, you can obtain a more realistic effect by using a Quadmap to transform the shadow instead of a Peg. A Quadmap is similar to a peg, except that it allows you to apply perspective effect to the drawings underneath it—see Quadmap Layer.